This gives a short description on how I make my pedestals and how I lay out the ASC tables. 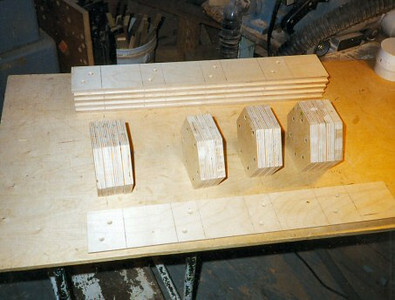 In making the pedestal, first I make 4 blocks, using 3 or 4 pieces of ¾” Baltic Birch plywood (for each block) (3/4” Baltic Birch plywood has at least 11 ply’s).They are cut to size and glued and screwed together. 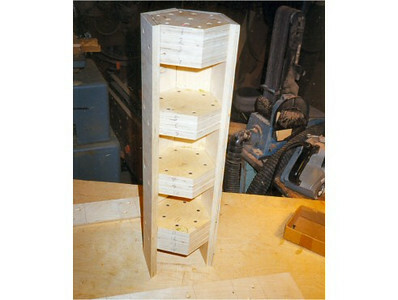 In the top block (or top and bottom for the 8-sided pedestal) I put T-nuts in between some of the pieces to bolt into. The side pieces are glued and screwed onto the middle blocks. This makes a pedestal base strong enough to drive over. It will scar the outside but it won’t brake it (I’ve tried it). The feet attach to the sides on the hexagon pedestal. On the octagon pedestal the feet cross and attach up into the bottom with 4 bolts. 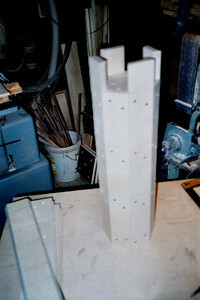 The pedestal is now ready to overlay with the pieces. On the octagon pedestal the feet cross and attach up into the bottom with 4 bolts. 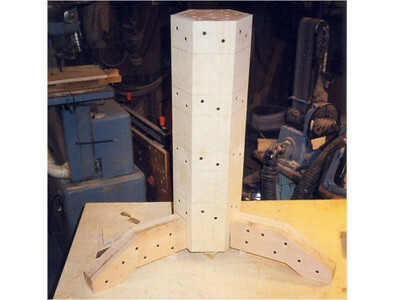 The pedestal is now ready to overlay with the pieces. In making the ASC Table I first draw a single line crossed in the middle of the board. Then starting from the middle I glue on the pieces making the quilt pattern in the middle. I keep making the quilt block on out to where the edge of the table will be, leaving off the last row of diamonds and triangles. I then on row of the quilt block going out 4 ways from the center. I measure how wide the blocks are and draw lines out that far, and a line in the middle on all 4 legs of the pattern. I then use the lines to help guide in gluing the other quilt blocks in place one piece at a time. With out the lines it is easy to get off. As far as that goes it’s easy with the lines. But they help. 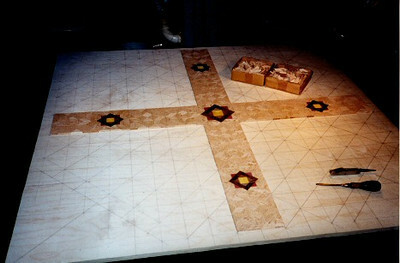 Then after the 4 corners are filled in to the edges (less one piece) I measure out about ½” and that is the cutoff line. This allows the top piece to hang over the piece that will come up under it on the side. From this point I precede as I do on the Star Table in putting the side pieces on. 4 sides of this table will be longer than the other 4 sides. That is just the way the pattern works out. I make sure the pieces from different boards are mixed up well as different boards will have different shades of color. I call this my “Large Oak ASC” table. 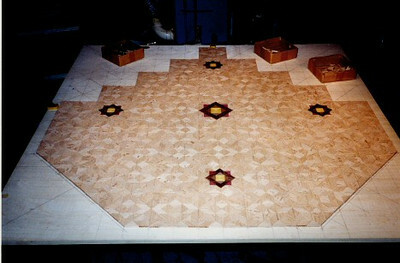 The pattern on this table is the “Aunt Sukeys Choice” quilt pattern. It is the same pattern that is on the “Oak Square Box”. As you can see on the square box, 2 diamonds are on each corner. 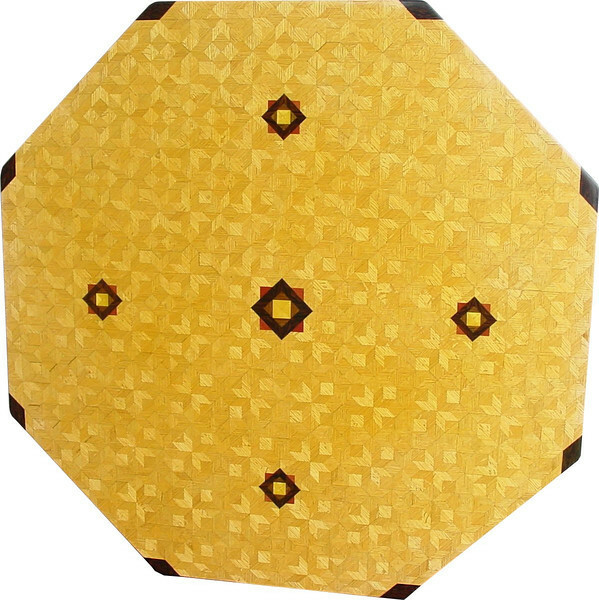 They form a star, when 4 of the patterns come together, as shows in the “Close-up”. Out from the center I have 4 half size patterns that are the same size that is on my “Oak Tiny Square Box”, twice as many pieces as would normally be in that area. The table stands 30” tall and is 48” wide. There are over 6000 pieces on the entire table. 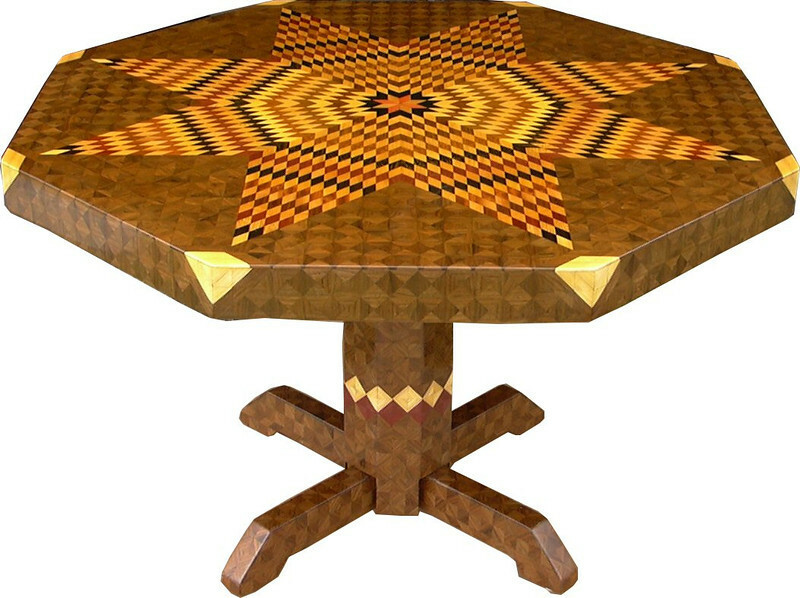 The pieces are used over the edge and onto the pedestal and feet of the table. The table is finished in its natural color with 6 or 8 coats of varnish. After the varnish hardens for at least a month, I level it and buff it to a high shine. The pieces are a bit over 3/16" thick, glued onto a Baltic Birch base, so they hold up much better than a thin veneer. The type of wood is listed on the bottom of the table from the center out. On this table the wood is "Satinwood" from South America, "Walnut" from Missouri, "Wenge" from West Africa, "Purpleheart" from Central or South America, and “Oak” from Missouri. I made this table in 2000 and got it finished in 2001. It is large table number 17. On the bottom I signed it, listed the wood, dated it and put the number of the table. As with everything I make I can find flaws in each item, be it box or table. It’s not perfect but you’ll look a long time to find a prettier table. This is a straight on look at the top of the table. The finish brightens the wood, and brings out the color. It’s like putting water on a rock, or polishing it, you can see the beauty of it then. I call this my “Large Flickering Lone Star” Brown tone Walnut table. 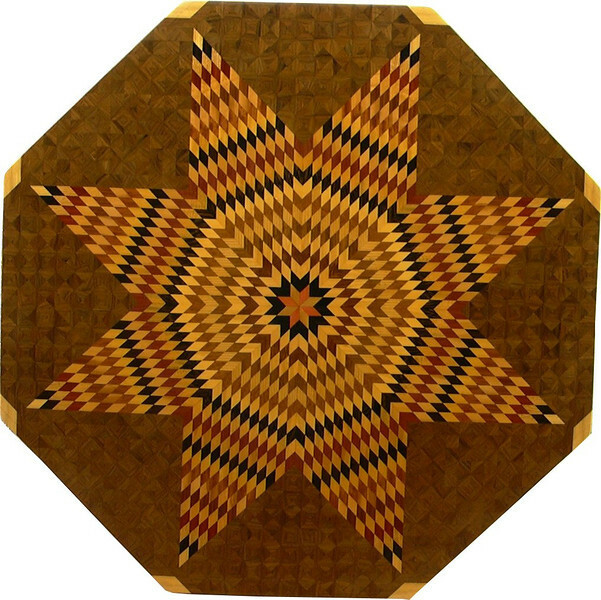 The pattern on the table is the “Lone Star” quilt pattern. The flickering part comes because I alternated light and dark wood, which gives it the illusion of movement. You can sometimes have a light headed feeling when you see it; it plays with your eyes. The table stands 30” tall and is 47” wide. There are over 6000 pieces on the entire table. 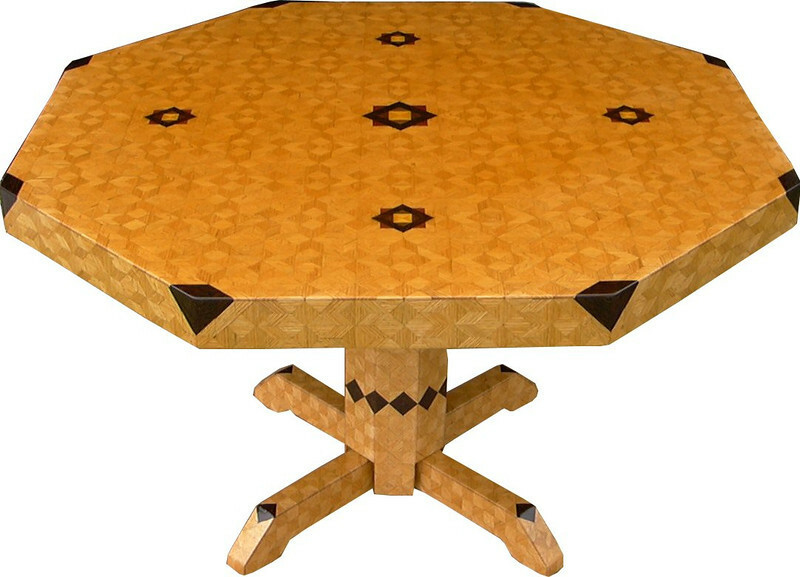 The pieces are used over the edge and onto the pedestal and feet of the table. The table is finished in its natural color with 6 or 8 coats of varnish. After the varnish hardens for at least a month, I level it and buff it to a high shine. The pieces are a bit over 3/16" thick, glued onto a Baltic Birch base, so they hold up much better than a thin veneer. The type of wood from the center out on this table is; (1) Pink Ivory, (2) Gabon Ebony, (3) Maple, (4) Chechem, (5) Tree Of Heaven, (6) Shedio, (7) Ash, (8)Lacewood, (9) Cottonwood, (10) Wenge, (11) Sycamore, (12) Purpleheart, (13)Birch, (14) Zaracote, (15) Satinwood, (16) Bubinga, (17) Crab Apple, (18)Boire, (19) Birds Eye Maple, (20) Bloodwood, (21) Oak, (22) Macassar Ebony, (23) Hackberry, (24) Walnut. When I make a large item, I figure out about how many pieces of walnut I will need. It’s usually 3 boards on a table this size, I will cut all 3 boards into strips and then take one strip from each board and build another pile until all the strips are in the forth pile. Every third strip of that pile will be from the same board. Each board will have slightly different shade to it, by mixing up the strips; I will have the walnut match all over the table. Even on the pedestal and feet will match the top this way.